Future wars are droid wars, and you command the action. You send in your Spiderdroid to take a strategic buildbiny by criss- crossing the structure with its unbreakable Droidweb. But watch out! Suddenly there are hungry Birddroids chasing you across the girders. You zig and zag as you weave, saving your secret weapon in cas the Birddroids corner you. And if you take the structure, you get only a few seconds to eat the frightened Birddroids before a new droid war demands your attention. Now it´s your advanced Mummydroid trying to wrap up another victory. 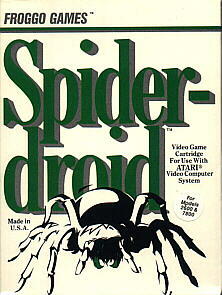 But you face a horrible horde of Skeledroids that are out to corner you and eat your Mummydroid alive!